A pool cover is an essential pool accessory that can help to increase safety and protect the water from debris. A pool cover is a must have for any in-ground pool in your yard. Pool covers protect the water from any excess dirt and debris while also protecting people from falling into the water as well. They also allow you to easily close and cover your pool during the off season. Here are the three main types of pool covers to help you decide which one is best for your pool. These are the cheapest of the three options and is simply a tarp that is placed across your pool and held into place with water tubes. A tarp pool cover is effective at blocking the sunlight from your pool which lessens your need for chemicals and also decreases the chance of algae growth. The downside to a tarp pool cover is that water can easily build up on top of the cover, which can cause it to sink into your pool if too much accumulates. The water tubes need to be replaced about every two years due to dry rotting and all water, leaves, and excess debris has to be pumped off of a tarp pool cover. These modern pools covers allow you to cover and uncover your pool with just the press of a button. 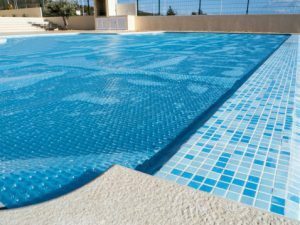 An automatic pool cover is going to be more on the expensive side and they are typically only sold in a rectangular shape. However, they provide great protection and safety for your pool. These covers keep your water free of outside contaminants and also helps to keep the sun’s harsh UV rays away from the water when it isn’t in use. These pool covers can be purchased either mesh or solid and will stretch all the way across your pool. They are held in place by springs and are also hooked onto an anchor to keep it still. The mesh safety cover is more popular because the solid one allows more buildup to accumulate. These pool covers can hold a pretty large amount of weight which is what makes them known for their safety. The mesh cover allows water to get through so that it won’t collect on top, while also catching leaves and debris. The downside to a safety pool cover is that sunlight does get through, which increases the chance of algae growing. Contact Sunrise Premier Pool Builders Today for Your Pool Cover! This entry was posted on Friday, July 27th, 2018 at 10:31 pm. Both comments and pings are currently closed.